In the future solar power plants will be as plentiful as personal computers or cell phones are today and they will generate energy on demand. Today I have witnessed the future of energy: a solar power plant capable of generating solar electricity around the clock. Located in the Spanish province of Andalucia, Torresol Energy’s Gemasolar is the world’s first utility-scale commercial baseload solar power plant. Torresol Energy, the company that built Gemasolar is a joint venture between Spanish infrastructure giant Sener and Masdar – Abu Dhabi’s Future Energy Company. During my visit to Gemasolar I met with Santiago Arias, Torresol’s Chief Infrastructure Officer and one of the co-founders of the company. Gemasolar, which officially launched last month (May 2011), is a 19.9-MW plant with a 15-hour ‘battery’. Gemasolar’s expected production is 110,000 MWh per year—or about enough to fully power 25,000 households. Because it can store energy, this 19.9 MW generates the equivalent of a 50 MW solar power plant without storage, according to Mr. Arias. Gemasolar’s battery consists of two tanks of molten salt thermal energy storage that allows the solar plant to generate on-demand electricity: during the evening, during cloud cover or rain, or even days or weeks later. Molten salt energy storage (MSES) or ‘solar salt’ batteries are thermal not chemistry-based batteries like Lithium-ion which power electric vehicles like Tesla’s (Nasdaq: TSLA) Roadsters. Potassium nitrate happens to be environmentally safer and cheaper than most chemical-based battery alternatives. In the Middle Ages, this ingredient was used to preserve food and it is still used in the production of corned beef. (2) Potassium nitrate is also used in toothpaste (for sensitive teeth) as well as in garden fertilizers. MSES capital costs are also relatively low, clocking in at $50 to $100 per kWh, compared to about ten times that for a Li-on battery that powers a personal computer or electric vehicle. Gemasolar is not the world’s first commercial solar plant with MSES. If I had driven another 300 Km (186 miles) due south-east on Andalucia’s A94 highway I would have seen Andasol-1, a 50 MW CSP plant that has been operating with a 7.5-hour battery since July 2009. Gemasolar basically doubled the battery availability to 15 hours. When most people think about solar power, they think of photovoltaic (PV) panels on the roof of a house or building. PV converts photons directly into electricity. Gemasolar belongs to a category called Concentrating Solar Power (CSP) which use the sun’s energy to heat a fluid (water, synthetic oil or molten salt) to generate steam which then drives a turbine to generate electricity. If you’ve ever used a magnifying glass or better yet a concave mirror to focus sunlight and burn a hole in a piece of paper, you get the idea. Use thousands (or millions) of square meters of mirrors (not PV panels) to reflect that same sunlight on a single point (actually small area), and you can heat a fluid flowing past it up to several hundred degrees Celsius and use that superheated fluid to drive an industrial-scale turbine. Each heliostat has reflective mirror surface about 110 square meters (1,184 square feet) and follows the sun using two motors with built-in pogrammable logic controllers (PLC) that recalculate and readjust the heliostat’s position 15 times per minute. As I walked under the heliostats I could hear the slight hissing sound of the motors moving the heliostats every 4 seconds. I went up to a heliostat to touch the reflective surface mirror and sure enough it was a mirror, not metal. When I asked Mr Arias about it, he said that these are slightly better mirrors than what I would have in my house. Santiago Arias, Torresol’s Chief Infrastructure Officer, started building power plants 38 years ago. He converses about the electricity market and gets excited about the impact of a solar power plant that can operate around the clock. “The maximum demand for electricity takes place during the evening on the hottest days of the year,” says Mr Arias. The market pays a premium price for electricity during those peak hours. 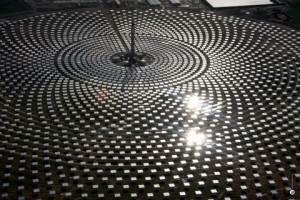 A solar power plant generates the most energy precisely during those hot sunny days.